Underneath all of that Batman gear do you think Batman sports a cool pair of knee high socks like these women’s athletic knee high socks seen here. 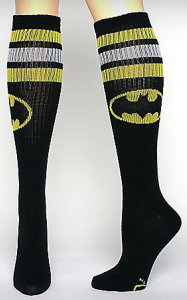 The Batman knee high socks are all black and feature a large Batman bat symbol of a bat in a yellow oval half way up the sock and near the top of the sock you see three stirpes, yellow, white, yellow in color looking like an athletic style. Made from a great blend of 75% acrylic and 25% spandex to give you everything you need in a sock from durability, comfort to a soft warm feel, it is available in a one size fits all that will range in a huge selection of sizes so all can enjoy this DC Comics Batman athletic sock.